It was fun looking for art to use on this cover. George Wilson and Matt Baker really did some amazing work on The Phantom and Phantom Lady, respectively. I love Wilson's realistic yet dynamic painting style and Baker really knew how to illustrate beautiful women and made great use of panel layout. As you say, At Last! And well worth the wait. I'm much more familiar with the Freedom Fighters version of Phantom Lady, in the yellow straps swimsuit. I never realized how Betty Page-ish she was back in the day. Awesome! One of the pairings I've been waiting for. The reason for all The PHANTOM requests are due to the fact that he goes great with just about any character. 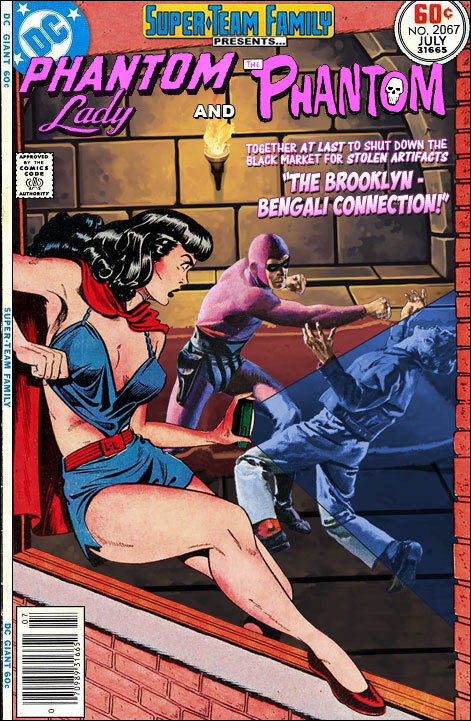 Well, now, I don't think I've heard of Phantom Lady before. Nice gams. "busy sound of readers around the world typing, 'but what about the Phantom this, or what about the phantom that'..."
Well, I did wonder, wasn't there a LSH gal named Phantom Girl? Oh, right, you've used her before. Anyone ever mention that the light-blue text on dark-blue background makes the tags kinda hard to read? Man! How I'd love to see a big budget version of that particular FF on the silver screen. *Sort of a cross between Raven and Dr. Strange. @ Anonymous How about this- Phantom Lady, The Phantom, The Phantom Stranger and Phantom Girl? "@ Anonymous How about this- Phantom Lady, The Phantom, The Phantom Stranger and Phantom Girl?" Thwarting the plans of the Phantom Blot? The Phantom, The Phantom Stranger, Phantom Lady, Phantom Girl, Nickelodeon's Danny Phantom, Golden-agers Bob Phantom, the Blonde Phantom, and the Phantom of the Fair...all battling the villains of Superman's Phantom Zone! @my namesake: to say nothing of my original character...Thomas Phan! I picture him as sort of a cross between Kato and Will Eisner's (The) Spirit. Mr. T and The Hulk! I Got a Cool New T-Shirt!